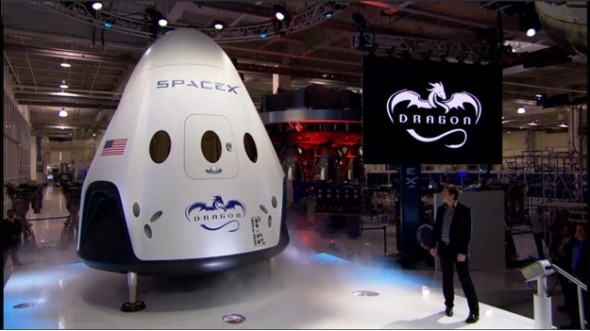 Thursday May 28th saw SpaceX, the private sector space company founded by Elon Musk, unveil the next iteration of their Dragon space vehicle, the Dragon V2. Dragon has been in operation in an unmanned mode since 2010, and was the first commercially built and operated spacecraft to be recovered successfully from orbit. In May 2012, it commenced uncrewed resupply flights to the International Space Station (which I covered here) as a part of NASA’s Commercial Orbital Transportation Services (COTS) development programme. Dragon V2 (which had previously been called Dragon Rider by the company) is a natural progression of the Dragon spacecraft, and while always in Spacex’s plans, having been originally announced in 2006, it has been part-funded by two US Government contracts, the Commercial Crew Development 2 (CCDev 2) in April 2011, and the Commercial Crew integrated Capability (CCiCap) in August 2012, both of which are focused on developing crewed vehicles capable of supporting the International Space Station (ISS) and of operating in low Earth orbit (LEO). Dragon V2 is capable of carrying up to seven crew, or a combination of crew and cargo. The vehicle is intended to be reusable, and capable of landing almost anywhere in the world using propulsive-landing via its eight SuperDraco engines (Dragon 1 is only capable of making splash downs). However, Dragon V2 will retain a parachute descent system for use as a back-up, although it can still make a safe touch-down even if two of its eight descent engines fail. Also, unlike Dragon 1, which makes a close rendezvous with the ISS before being grabbed by one of the station’s robot arms and manoeuvred into a docking position, Dragon 2 will be able to undertake fully automated dockings with the ISS. Nor does it end there. There are some ambitious plans for Dragon. The head shield, for example, is already capable of protecting the vehicle during re-entry into the Earth’s atmosphere at velocities equivalent to those of a vehicle returning from the Moon or from Mars – and SpaceX has been working with NASA Ames Centre, California, on a conceptual uncrewed Mars mission evolution called Red Dragon. Potentially funded under NASA’s Discovery mission programme, Red Dragon, if given the green light, would provide a cost-effective means for NASA to undertake a sample return mission to Mars, allowing up to two tonnes of samples to be returned to Earth for detailed investigation and analysis in 2022, ahead of NASA’s goal of sending humans to Mars in the 2030s. Other have even more ambitious plans for Dragon and Mars. Dutch-based Mars One plans to kick-start a permanent, self-sufficient human colony on Mars from the mid-2020, with crews leaving Earth on a one-way trip every two years. 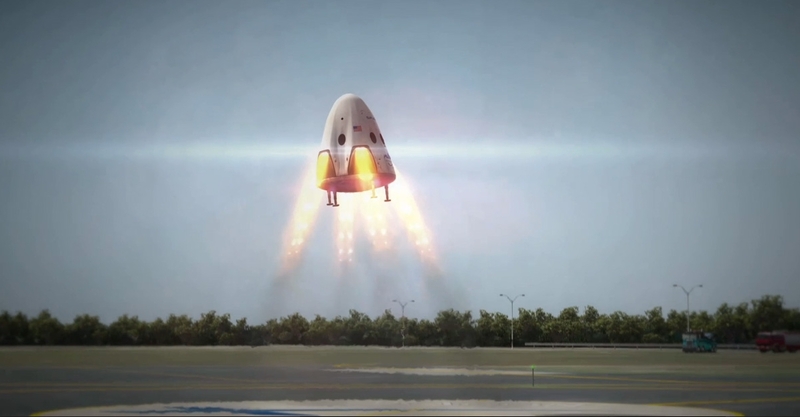 According to the Mars One website, they hope to be able to use the Dragon vehicle and its associated Falcon 9 heavy launch vehicle also constructed by SpaceX, although there has been no public confirmation as to whether formal discussions with SpaceX have taken place. Such plans aside, however, the first actual crewed mission for Dragon V2 is unlikely to occur prior to 2016. The next major milestone for the vehicle is a launchpad abort test, scheduled for later in 2014. This will see the vehicle positioned at pad height and then launched to simulate an emergency in which the crew must escape their launch vehicle. After this, in 2015, there should be a high altitude abort test at Max Q, the period in the vehicle’s ascent when it is exposed to the maximum dynamic pressure. Both tests will feature the use of the vehicle’s SuperDraco engines, which form a part of the escape system as well as powering the craft during descent and landing. Capable of multiple re-starts and what is called “deep throttling”, the engines are themselves unique – the first ever fully printed rocket engines ever flown, produced by a direct metal laser sintering process. If both of these tests are successful then it is conceivable that Dragon V2 could make an initial uncrewed orbital flight towards the end of 2015, and its first crewed flight in 2016. Despite the political situation in Ukraine leading to tensions between the US, Europe and Russia, which has led to recent posturing from the Russians regarding flying American astronauts to the ISS aboard their Soyuz spacecraft (the only crewed means of reaching the space station at present), there is no rush to press Dragon V2 or any other private sector vehicle into service. This is because NASA has recently agreed $458 million deal for astronauts to continue to fly to the ISS aboard Soyuz through until the end of 2018. Nor might Dragon V2 be the only vehicle to operate as an ISS crew ferry. Both Boeing and the Sierra Nevada Corporation also received funding under CCiCap for further development of their own space transportation systems. Boeing is developing the CST-100, another capsule-based system, which received the largest share of CCiCap funding ($460 million, Dragon 2 having received $440 million). The Sierra Nevada Corporation is developing DreamChaser, a dynamic lifting body type of vehicle, launched from atop a rocket and capable of conventional aircraft-like landings. 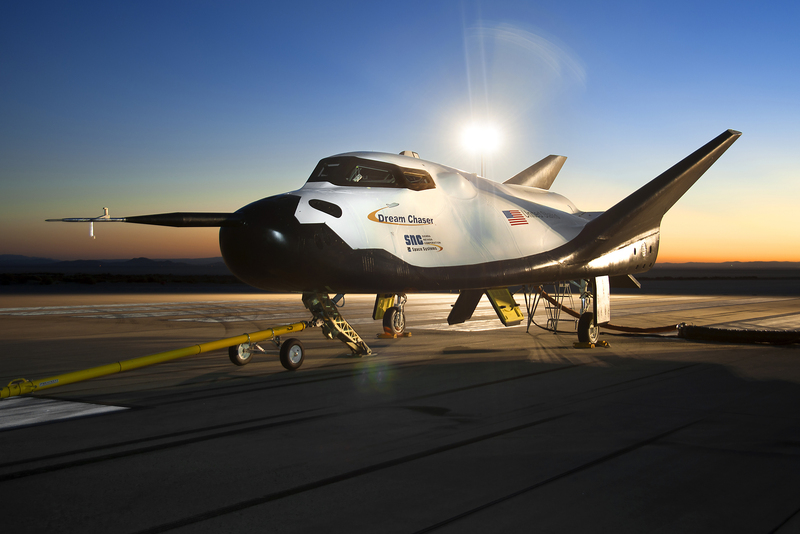 Both the CST-100 and Dream Chaser are also capable of flying up to seven crew. While ferry flights to LEO are moving towards the commercial sector, it doesn’t mean the US Government – through NASA – has given up on building crewed space vehicles. If the Dragon V2 launch abort test goes ahead around the end of 2014, it may well be occurring around the same time as NASA launches the first of its next generation human-rated spacecraft: the Orion Multi-Purpose Crew Vehicle (MPCV). Like the Boeing CST-100 and Dragon V2, Orion is a capsule system, and is being developed for NASA by Lockheed Martin and Astrium on behalf of the European Space Agency. Unlike Dragon V2 and the CST-100, however, Orion’s mission is not to support the ISS – although it can do that in a back-up capacity, if required. Instead, Orion is intended for far bolder missions: a return to the Moon, missions to a near-Earth asteroid and to cislunar space – and even, potentially, human missions to Mars. Orion’s heritage is similar to that of Apollo from the 1960/70s. The basic vehicle comprises two parts: the Crew Module (CM), being built by Lockheed Martin, and a Service Module (SM), holding the spacecraft’s propulsion system and expendable supplies. The Service Module will be supplied by Astrium as an evolution of ESA’s Automated Transfer Vehicle, Europe’s uncrewed vehicle capable of lifting up to 8 tonnes of supplies and cargo to the ISS. For deep space missions, the Orion MPCV would be used in conjunction with a system such as the Deep Space Habitat (currently only an NASA concept). The December 2014 launch of Orion will be uncrewed and the first Exploration Flight Test. It will use NASA’s veritable Delta IV launch vehicle. However, a new Space Launch System (SLS) is currently under development by NASA, and is designed to be used to launch Orion missions. NASA has currently timetabled three missions using the SLS. The first of these, in 2017, will to send an uncrewed Orion around the Moon. The second, around 2021 is expected to send a crew of two to rendezvous with a captured asteroid in lunar orbit. The destination of the third, scheduled for around 2022, has yet to be determined.